As you could probably tell by my previous post, I’ve been enjoying a change of pace in how I think about my build and what I ultimately want the car to be as of late. My perspective and vision for the car has changed numerous times over the years- something I believe to be a direct result of experiences I’ve had and the communities I have been surrounded by. When I first bought my S13 in 2008, I was crossing over from the Camry/Solara community (which really does exist if you can believe it.) Since everyone in that group was building an uncommon platform with minimal aftermarket support, it was critical that the build be executed in a clean and subtle manner. No large mufflers, stickers, gaudy aero, or poorly executed installs would be accepted by the mainstream tuning crowd and had to be avoided if you wanted to truly build something impressive. 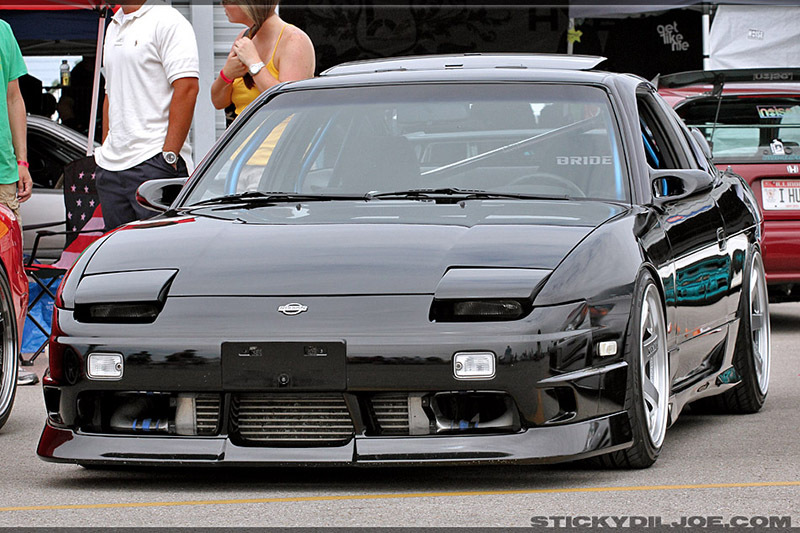 I carried that same thinking into my S13 build when I first began by keeping the exterior relatively simple with subtle aero pieces like the Xenon front lip and OEM chuki side skirts and rear valences. As I spent more time in the Nissan community, I learned that the standards for what made a respectable build were much different than they were in the Toyota crowd. Fiberglass aero and loud paint jobs were not only commonplace, but widely accepted. With inspiration from guys like Toby Broadfield (who built possibly the most well executed, OEM styled S13 coupe of all time) and Brian Harte (who managed to use a cool combination of OEM and aftermarket parts to build a 180SX that looked straight out of an Option mag,) I managed to build a car that in a way spanned both arenas. It checked the right boxes for the nit-picky, clean resto-mod inspired builders and the more drift-friendly guys trying to emulate early 2000s Japanese styling. It didn’t completely nail one of the other, but it could hold its own among both audiences. In 2012, things got pretty wild. I was still continuing to try to build a car that fit into several categories all at once. The shaved engine bay, aggressive Blitz 03 wheels, and wild multi-colored interior blended both styles to what I feel was ultimately a bit of a fault. The car no longer felt as cohesive and didn’t have the 2001 Japan Aura it once was a bit closer to pulling off. Sure, it had a lot of really cool parts on it, but the car just didn’t feel as well thought out to me. Ultimately, I ended up parting it out by November 2012. As you now know, I bought the shell back in November 2014 from the friend I sold it to two years prior and began anew. I wanted to do things similar to how I had when I owned the car previously, but also felt like I wanted it to be new and exciting. I ended up styling the car after Itai and Koguchi’s cars with Hot Road aero, a Koguchi Power hood, Carbon Kevlar Bride Zieg II and Zeta II, etc. Many aspects like the exterior were the most wild they had ever been, but others were more subtle than previous iterations- like the interior. At the end of the day, I loved what I had managed to build. In 2011 I could only dream of owning Hot Road aero and a Koguchi Power hood, but now that I had more or less completed the car it wasn’t what I thought it would be. I’ll always love that stage of the car, but I’ve come to feel recently that a heavily modified chassis clad in fiberglass aero with a wild interior isn’t what I am going to want this car to be when I’m an old man taking it to Dairy Queen with my wife on a Saturday afternoon. In the spirit of thinking about a car in this mindset, I’ve set out to find some specific components for the interior. 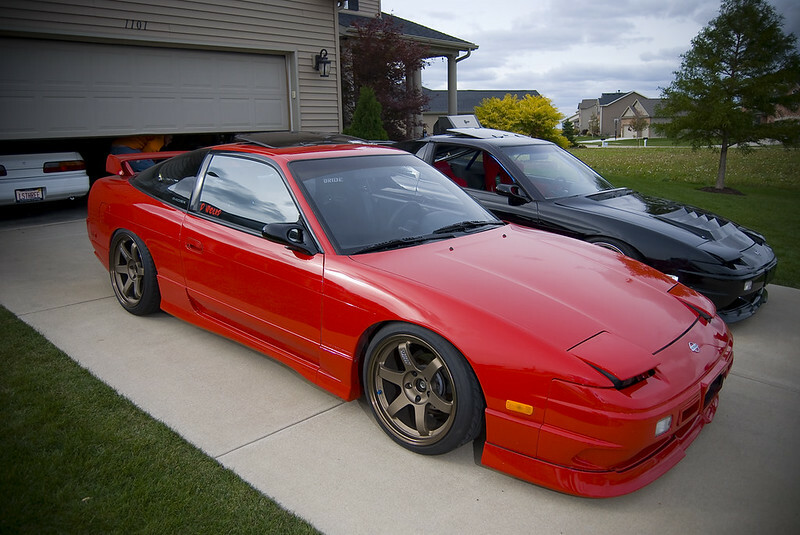 My good friend Joseph from Canada is going to be bringing my Kouki 180SX front and rear seats to my house next weekend. He’s also working on sourcing a Canadian headliner for me that I’ve been after for many years to get rid of the gap between my Japanese A pillar covers and the USDM headliner. I’m going to pick up a pair of rear seat brackets so that I can mount the 180SX rear seats properly as I lost mine a few years back. The NeXt Miracle brace will stay put for now, wedged between the rear seat and my OEM privacy cover. I would one day like to reinstall the factory rear seat belts so that my daughters can ride in the car with us, but I don’t see needing to do that soon as installing their car seats would be a big pain. But I do think it would be cool to do that at some point. I think I will dye the gray rear trunk area panels black to match the carpet and clean things up. My carpet still has holes in it from the Cusco cage and Do Luck floor bar, so replacing that would be nice. The door panels are currently without fabric as the tweed has been removed, so I’d like to clean those up with some sort of simple black fabric as well. 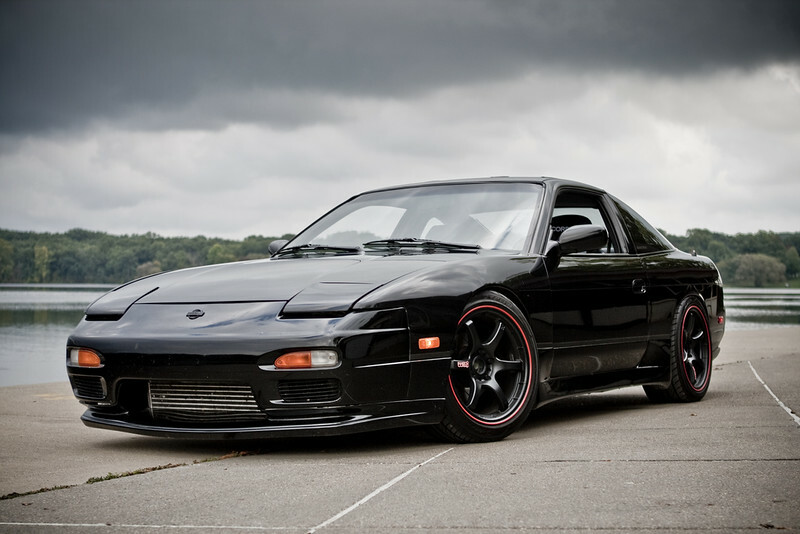 I would essentially like to end up with a clean, complete factory interior with 180SX seats, my Nardi wheel, GREX shift knob, and a bucket seat I can swap in for any events I decide to participate in. Who knows, maybe I’ll finally buy speakers and a decent head unit for this thing- but that’s crazy talk. So, that’s the plan for the interior. As for the exterior, as I mentioned in my last post I am awaiting the arrival of the final OEM kouki 180SX pieces before everything can go in for paint. The only exterior things I’m really debating are the front lights. My wiring has always been cobbled together for the front turn signals, position lamps, and side markers. I’m considering purchasing the full OEM setup with some adapter pigtails from a seller on Zilvia so that I can finally have all of the proper lights and plugs in place. My only hesitation is that I do really like the Japanese-inspired look of running clear dual function position lamps with no turn signals and clear sidemarkers. Maybe I’ll end up with both and switch them out as I see fit to change the appearance from time to time. 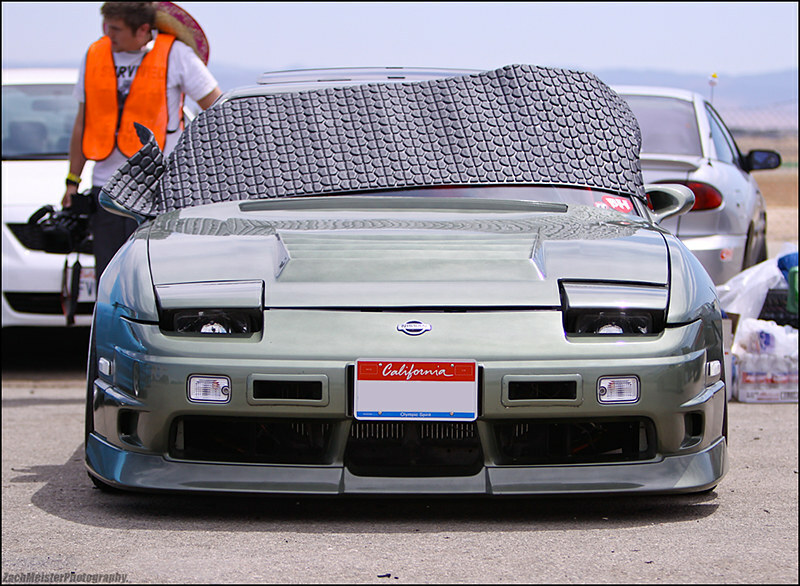 I’ve always loved the look of NISMO R33 N1 ducts installed on the OEM kouki 180SX bumper with a front plate cutout. I’ve debated trying it several times over the years, but never managed to make myself do it. Well, I saw a new OEM pair of vents on Zilvia this morning and hadn’t seen any for a while, so I decided to grab them. I’ll have to decide what I want to do before paint. I’m thinking either go with the cutout/vents and clear lights/no signals, or full OEM look with no vents, no cutouts, and OEM lights. Again, this would be a cool thing to switch back and forth between. Ideally I would have a spare OEM bumper on standby, but I’m not sure that will happen. And finally, side mirrors… I’ve still got my Ganadors but have yet to decide what to run. This is another thing I can easily switch back and forth between. In the end, I’m actually feeling really inspired by my buddy Kyle’s old red hatch and a few of the other cars built stateside around 2010-2011. Full OEM Kouki 180SX aero with subtle additions like N1 ducts and Ganador mirrors, full OEM 180SX interior with a couple cool pieces like a Nardi wheel, shift knob, and maybe a bucket seat; and a stock SR with a couple of small power adders under the hood. Simple suspension and brake modifications with a really nice set of wheels or two. 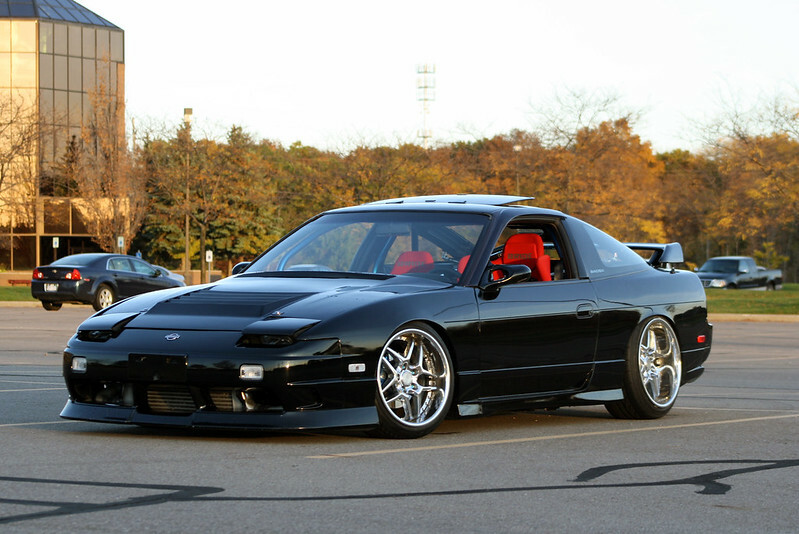 It’s easy to think something like this is boring or unoriginal, but when I really take a step back and think about what I want in an S13 that I’m going to keep forever, that’s what fits the bill. I’m looking forward to trying to execute on this vision over the next couple of months. My hope is to make this site my home for the project over the coming months instead of Zilvia or Instagram. It’s nice to get back to more thorough documentation with nicer photos to accompany the words. Thanks for reading my rambling! It’s really exciting to see you take the car this direction. Good luck! Thanks Randy! I’m looking forward to an element of simplicity. I’ll always love all the crazy stuff but it’s just not practical! haha. Thanks for using my pic of BH’s old car bro. Happy to see someone’s still building clean 240’s. Keep it up! Thank you sir! Hopefully that’s cool, I was hoping if I left the watermark the photographer would be cool with it, haha.